Cranberry's strong antimicrobial properties have been primarily used for the treatment of urinary tract infections (UTI's), which may have played a role in minimizing the potential benefits of this fruit for the treatment of other health conditions; as a consequence, the influence of cranberries on cardiovascular, metabolic, and degenerative diseases has been scarcely investigated. Since a possible link between cranberry juice and diabetes symptoms improvement has been suggested before, this randomized, controlled trial analyzed the benefits of drinking cranberry juice for lowering the most common markers of metabolic diseases, such as blood sugar levels, oxidative damage, inflammation, and metabolism of fats in overweight humans. Boon Chew, professor and Head of the Department of Nutrition and Food Science at Texas A&M University, teamed up with a multidisciplinary group of scientists in order to discover whether the consumption of cranberry juice have an impact on the metabolic markers of 78 overweight men and women, ages 30-70. The participants of the randomized, double blind trial were given 450 mL of either a placebo or a low calorie, high polyphenol cranberry juice every day, during eight weeks. Blood and urine samples were taken before the study, immediately after the first administration of the placebo or cranberry drink, and at the end of the trial. In order to rule out the influence of dietary factors, all the participants were provided with meals low in polyphenols two days before each sample collection visit. Regarding gender, age, and body mass index, as well as hip and waist ratio, the analysis showed no significant differences between the placebo and cranberry beverage groups. However, compared to the placebo, a single dose of the cranberry juice, administered at the beginning of the trial, reduced endothelin-1, a vasoconstrictor peptide secreted by the endothelial cells, and raised levels of nitric oxide, a molecule that relaxes blood vessels, increasing blood flow throughout the body. Other markers that registered changes after the initial consumption of cranberry juice were glutathione, an important antioxidant compound, whose rate of degradation was reduced, and interferon gamma, a cytokine that plays a critical role in fighting inflammation and infections, whose levels increased. After the eight weeks trial, the group that was given the cranberry beverage registered lower levels of C-reactive protein, which is produced by the liver and rises when there is inflammation throughout the body, as well as reduced concentrations of insulin, a pancreatic hormone that is mainly responsible for the transportation and storage of glucose, which is used as an energy source for vital bodily functions. 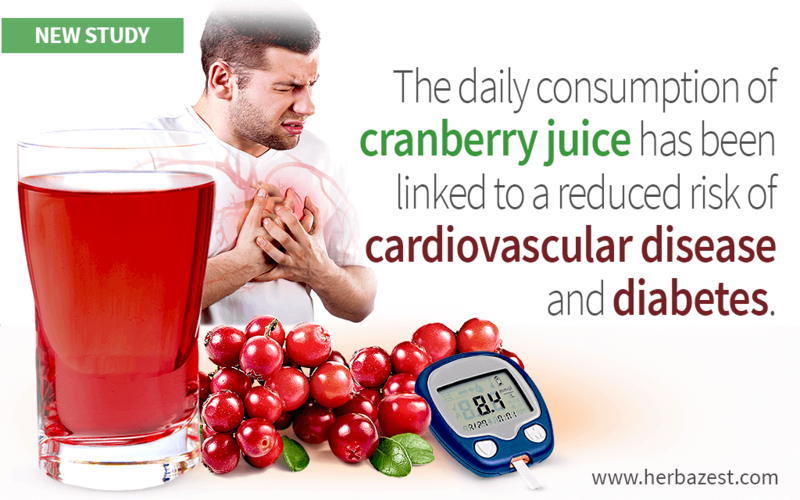 The analysis also showed increased levels of high-density lipoproteins (HDL), commonly known as "good cholesterol," due to its ability of helping remove harmful low-density lipoproteins (LDL) from the bloodstream, thus boosting cardiovascular health, which corroborates the benefits of cranberry juice for cholesterol reduction. The consumption of cranberry juice high in polyphenols, in a single daily dose of 450 mL, was shown effective reducing the risk of metabolic diseases by enhancing glucose and fats metabolism, as well as decreasing inflammation and increasing the presence of HDL cholesterol. This promising study may lead to new and complementary protocols for treating obesity and metabolic diseases, which can help prevent or reverse the development of cardiovascular disease and diabetes. It is worth to mention that many other herbs, such as avocado, olive, and walnut, provide hypocholesterolemic properties, whereas cinnamon, lucuma, and yacon improve glucose metabolism, helping to lower blood sugar levels.